ZAZ GPS powered by SG Connected Car is a comprehensive solution that allows auto dealerships to manage their vehicle asset investment. ZAZ saves time, increases staff productivity, improves customer service and reduces expenses. Our advanced GPS Dealer Inventory Management system allows dealer staff to instantly locate any new, used, loaner or dealer owned vehicles on or off the lot. 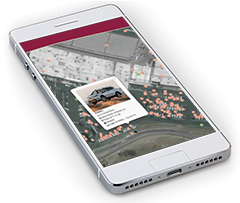 It helps dealers pinpoint the real-time exact location of any vehicle quickly and accurately. Managers can breeze through inventory audits by locating and verifying any vehicle, including demo and loaner stock. The system can also generate low battery email alerts. Service department can then quickly locate and repair vehicle before any embarrassing moments occur in front of potential customers. You can also sort and search inventory by a wide range of parameters, including color make model and year. The system saves precious staff time, improves efficiency and reduces cost. ZAZ GPS offers the industry’s most comprehensive Dealer Inventory Management system in the market today.